The Challenge was launched in September of 2010 at the White House by President Obama and the first year winners were announced by Aneesh Chopra, former Chief Technology Officer for the United States at The Atlantic’s Technology in Education Forum in Washington, DC in March of 2011. The Inaugural Challenge featured three competition categories: a Middle School Prize, Collegiate Prize, and Developer Prize and drew more than 600 entries from students, teachers, collegiate developers, and professional digital game makers. Several of the games produced by applicants in the collegiate and developer categories were commercially published and the Challenge received strong media attention from major outlets such as CNN, Forbes, Education Week, and Gamasutra as well as local and national press for the student winners. Over one third of the student winners came from Title I schools. 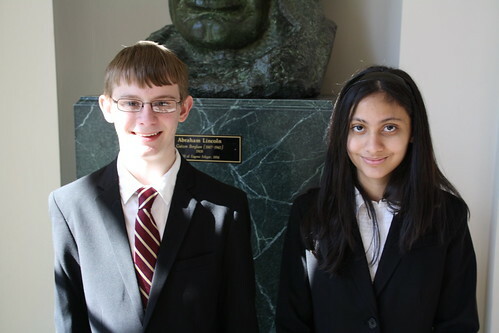 In February of 2012, two of our youth winners from the Inaugural Challenge were invited to exhibit their games at the White House Science Fair! The second year of the Challenge was launched in partnership with Digital Promise, a new initiative created by the President and Congress, supported through the Department of Education. The initiative is designed to unlock the promise of breakthrough technologies to transform teaching and learning. The 2012 Challenge featured opportunities for Middle and High School students in both individual and team categories, as well as College Students and Professional Educators. Over the course of the competition, over 3,700 original games were submitted. In May of 2012, 28 talented young designers from around the country were honored at a ceremony held at the Smithsonian Institution in Washington, DC. Five outstanding games developed by College Students and Pre K-12 educators were also honored. For 2013, the Challenge, focused its efforts on the youth categories and expanding the mentorship opportunities available to youth interested in participating in the Challenge. Through partnerships with the Institute of Museum and Library Services (IMLS) and the HIVE NYC Learning Network, we launched a series of teacher and youth workshops, mentorship programs and peer-to-peer training sessions. Through these collaborations, we also learned a great deal about our entrants. For example, over 54% of participants received support and mentorship from their teachers and 1/3 of the entries received were created by girls. 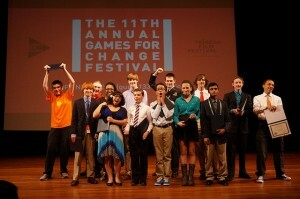 Out of approximately 4,000 entries received, 16 national middle and high school winners took top prizes and were honored at the 2014 Games for Change Festival in New York City. The fourth year of the STEM Challenge concentrated on supporting rural and under served youth, as well as sparking sustainable STEM initiatives in the city of Pittsburgh. The Challenge traveled to host over 50 events across the country, and by the time the submission period closed on March 30, 2015, over 4,000 entries were received. This included over 15 workshops conducted as part of a regional spotlight in the Pittsburgh area supported by the Grable Foundation and managed by the Sprout Fund. AARP and Mentor Up (an AARP Foundation) also supported a series of community workshops to encourage intergenerational learning and game design.The names of 15 middle and high school winners in 13 categories were announced at an awards program and gaming celebration in Pittsburgh at WQED on June 27, 2015. The 2014-15 STEM Challenge, presented by the Smithsonian in partnership with E-Line Media and the Joan Ganz Cooney Center at Sesame Workshop, was supported by founding sponsor the Entertainment Software Association, corporate sponsor Bayer, and national community program sponsor the Institute of Museum and Library Services (IMLS). The 2016 STEM Challenge was once again presented by the Joan Ganz Cooney Center at Sesame Workshop and E-Line Media, with founding sponsor the Entertainment Software Association (ESA). Unlike previous cycles, this was the first one that afforded students the opportunity to design their video games during the school year and into the summer months, and nearly 5,000 middle and high schoolers registered for the competition. From March 15th – August 15th, the STEM Challenge conducted nearly 60 game design workshop and events, thanks to our National Community Sponsors the Institute of Museum and Library Services (IMLS), and our Pittsburgh Regional Spotlight Program Sponsor The Grable Foundation. Another highlight of the 2016 cycle was the addition of the Nat Geo Explore Prize stream, sponsored by the National Geographic Society, that honored game designs that thematically expressed the spirit of exploration and adventure. All 24 middle and high school winners in 18 categories were recognized at an awards ceremony at National Geographic in Washington, DC on November 14th. This celebration also marked the fifth anniversary of the STEM Challenge, and special guests from the White House Office of Science and Technology Policy and the U.S. Department of Education joined the winners, their families, sponsors, and other VIPs to honor President Obama’s “Educate to Innovate Campaign” that motivated youth to explore STEM pathways.